One of the most widely grown fruits in home gardens, raspberries (Rubus idaeus) provide a good crop in relation to the space they occupy. 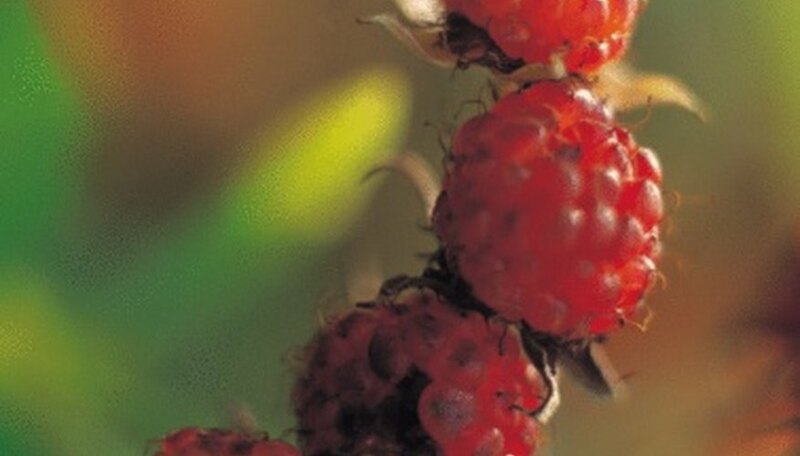 Although many varieties of raspberries grow well in Wisconsin, winters in the northern areas of the state may be too cold for some varieties to survive. Pick varieties that are shown to be hardy in your particular area. Choose a location in full sun with fertile, rich, well-drained soil. Space raspberries 2 to 4 feet apart in rows 6 to 8 feet apart, depending on the variety. Put down a 2 to 3 inch layer of peat moss, a 1 to 2 inch layer of compost and a 1 to 2 inch layer of coarse builders' sand on the surface of the soil. Add all purpose granulated fertilizer, following the application rates recommended by the fertilizer manufacturer. Incorporate the fertilizer and soil amendments by rototilling or turning the soil over with a garden spade. Erect a row-trellis to support the raspberries. Secure 4 to 6 inch diameter, 7-foot posts at least 24 inches into the ground every 20 feet along the row and at either end of the row. Connect the posts with thick, sturdy wire attached at a height of 4 feet from the ground and a second wire about 20 inches above the ground. Plant raspberry plants 2 to 4 feet apart in rows 6 to 8 feet apart. Dig a hole large enough to accommodate the roots of the individual plants when fanned out. Place plants into the hole and backfill with soil, pressing it down gently with your foot as you go. Spread a mulch of straw or hay about 2 inches deep over the surface of the raspberry bed. This will discourage weeds from growing and help keep the soil evenly moist. Water in the newly planted raspberries using a soaker hose. Lay the hose near the base of the plants and allow it to water them in for 60 to 90 minutes. Thereafter, provide raspberries with the equivalent of 1 inch of rainfall per week during the growing season. Cut fruit-bearing canes down to the ground immediately after harvesting the berries. New canes will grow from the base of the plant and produce raspberries the following year. Thin out small, new canes already growing, leaving the three or four strongest canes in each foot of row. Do not cut back the growing tips until the following spring. In early spring, before the leaves open, head back the canes by removing the growing tip, but no more than one-fourth of the length of the cane. Also, shorten the side branches in the same manner as the tops of the canes. Inspect raspberries frequently for signs of pests and diseases. Spray promptly with insecticide to control insect pests such as raspberry cane maggots or borers. Treat fungal diseases such as powdery mildew, spur or cane blight with a fungicide spray, following the manufacturer's instructions. Choose varieties of raspberries that are known to grow well in Wisconsin. Summer-bearing raspberries to grow in Wisconsin include Boyne, Haida or Festival. Fall-bearing raspberries for Wisconsin gardens include Carolina, Autumn Bliss and Summit.